With styling reminiscent of early Hibben bowies, this Hibben Survivor Bowie knife is the ultimate jungle warrior. 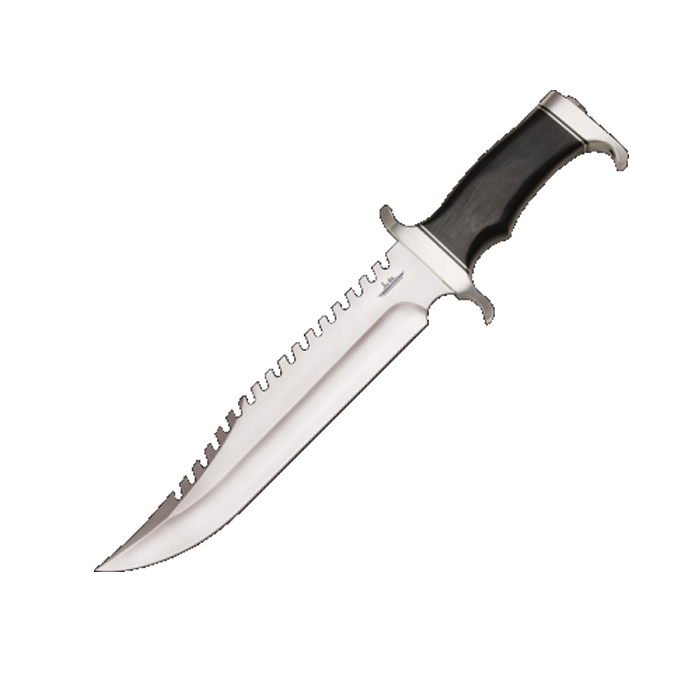 This massive knife offers a 10” razor-sharp stainless steel blade with powerful sawback teeth. The micarta handle offers a solid, ergonomic grip as the polished hand guard protects your hand from slipping to the blade. Lashing holes are pre-drilled in the guard and pommel to allow for spear making by lashing the knife to a long, wooden handle. Includes a custom leather belt sheath with the Hibben Custom Design logo stamped right into the leather and a certificate of authenticity.